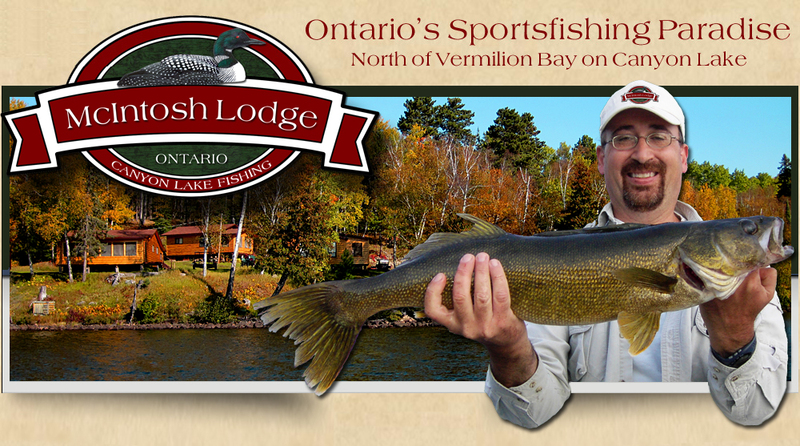 If you are looking for a fishing destination in the remote wilderness of beautiful Northwestern Ontario, then you have come to the right place! 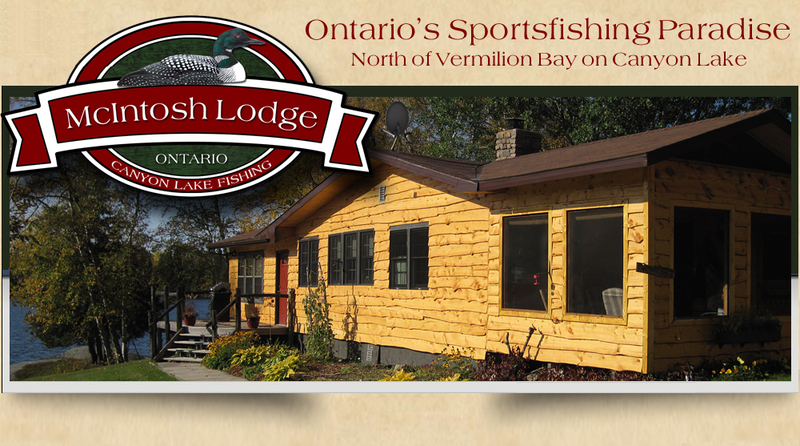 McIntosh Lodge offers clean, comfortable, fully-equipped, and affordable lakefront cabins. 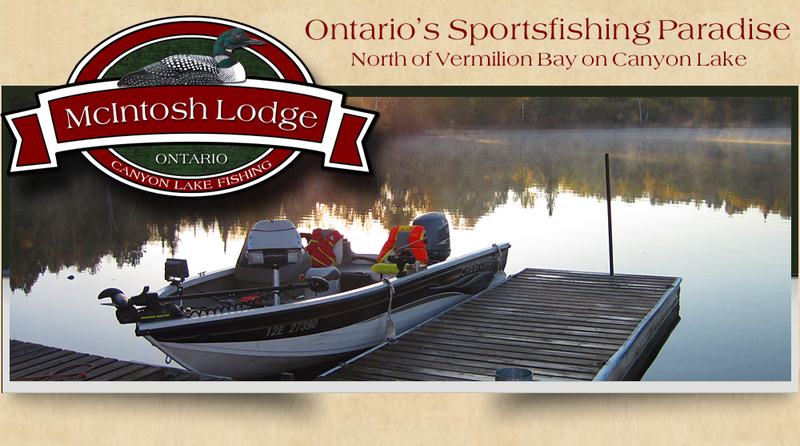 We are located north of Vermilion Bay and the Trans-Canada Highway on the eastern shores of famous Canyon Lake. Canyon Lake is well known for fantastic Muskie fishing, as well as Walleye fishing, Smallmouth Bass fishing, and Whitefish angling. 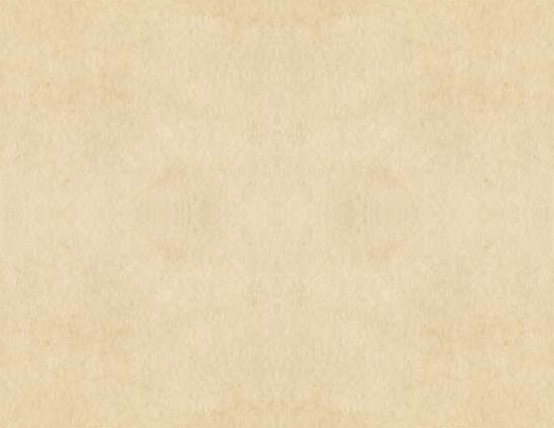 Muskie are mostly in the 30-40 inch range. However, guests often catch Muskie over 50 inches, and we have seen pictures of even larger Canyon Lake Muskie. Guests have reported Muskie that pushed the 40-pound range! 14-18 inch Walleye are most common, though guests do catch Walleye up to 13 pounds from time-to-time. The largest Walleye we have seen since owning the camp was 33.5 inches. You always have a chance at a trophy Walleye on Canyon Lake. 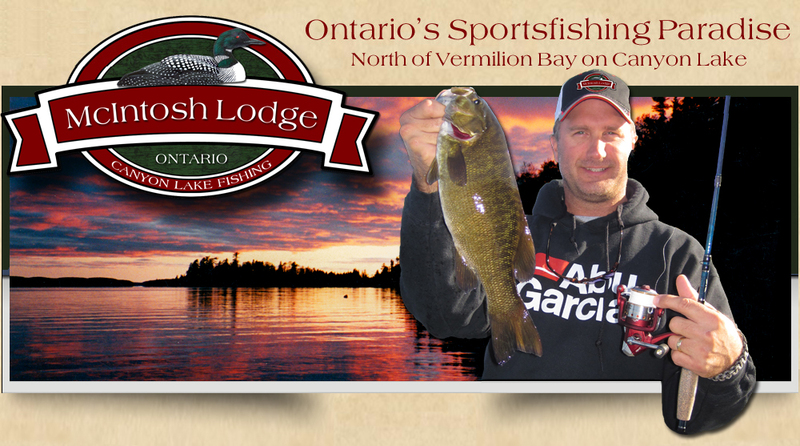 Guests enjoy a good number of Smallmouth Bass in the 13-16 inch range. The largest Smallmouth Bass caught in the last couple of years was 21.5 inches and 6 pounds. 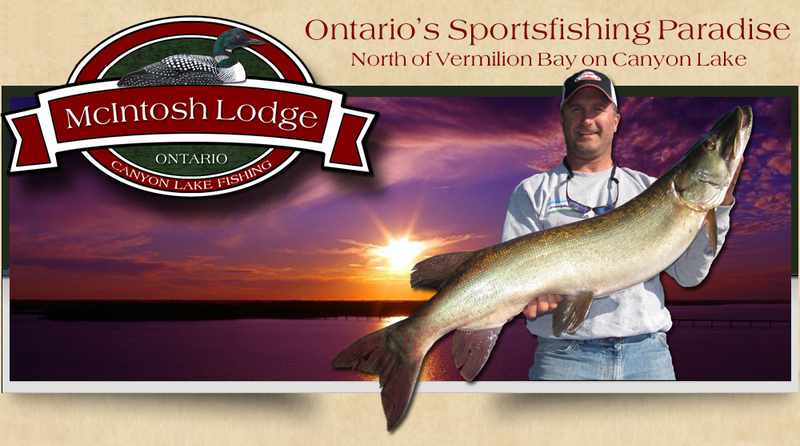 Lake Trout Fishing and Northern Pike Fishing is also available. 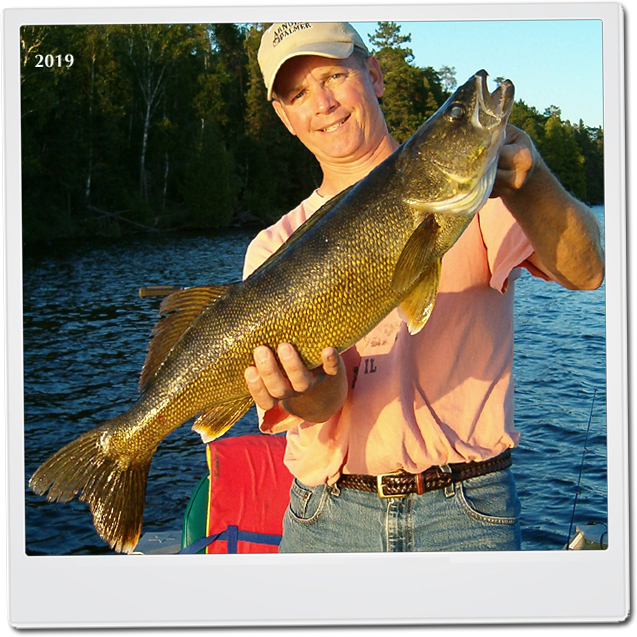 These fish species are not found in Canyon Lake, but we do have backcountry portage lakes not too far from the lodge where you can catch really nice sized Lake Trout and plenty of Northern Pike. Our facilities consist of a relaxing main lodge, which has a large room open to guests that includes a fireplace and tables for playing cards or games with the kids. We offer five fully-equipped lakefront housekeeping cottages that sleep four to eight people. 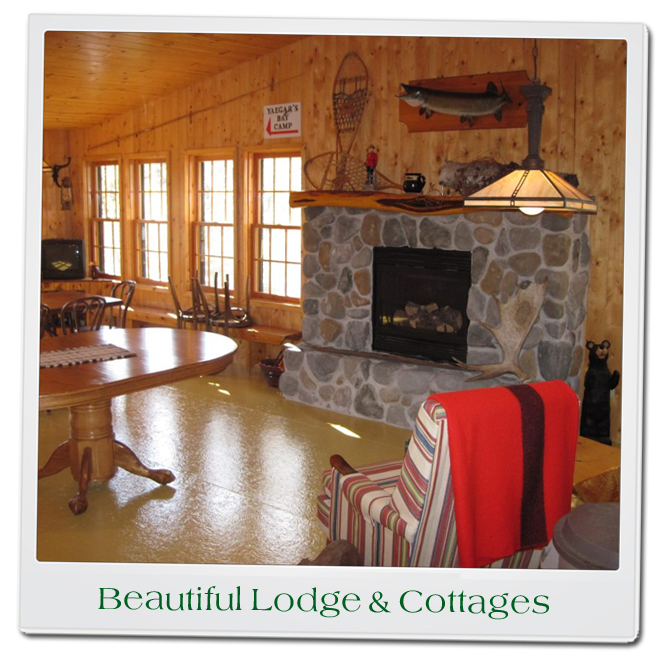 Our main lodge and cabins are all tastefully decorated with natural pine and comfortable furniture. We have sturdy docks, which are protected by the main winds along with fuel and electric hook-up. The lodge also has a big new fish cleaning facility, which is big enough to have 4 people clean fish at one time. The fish cleaning facility is clean with double sinks and refrigerator-freezer. We have really nice 16-foot Naden Big Fish fishing boats with 20hp Yamaha 4-stroke motors. 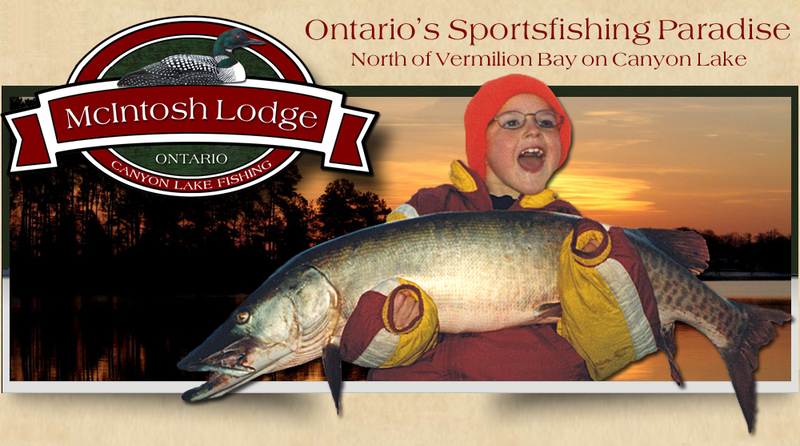 There are many local attractions around the lodge apart from fishing, as well as activities for the whole family near Vermilion Bay or Dryden. We have hiking trails that lead to a beautiful waterfall. There is also boating, swimming, berry picking and many other activities to enjoy. Within driving distance from camp there are several tourist attractions including restaurants, gift shops, and golf courses.  Please explore our web site, and feel assured that we will do everything we can to make your fishing vacation an enjoyable experience that you will always remember.